Excel Transactions Importer and Deleter is an intuitive and powerful tool for importing, exporting, updating and deleting transactions from your files to QuickBooks. 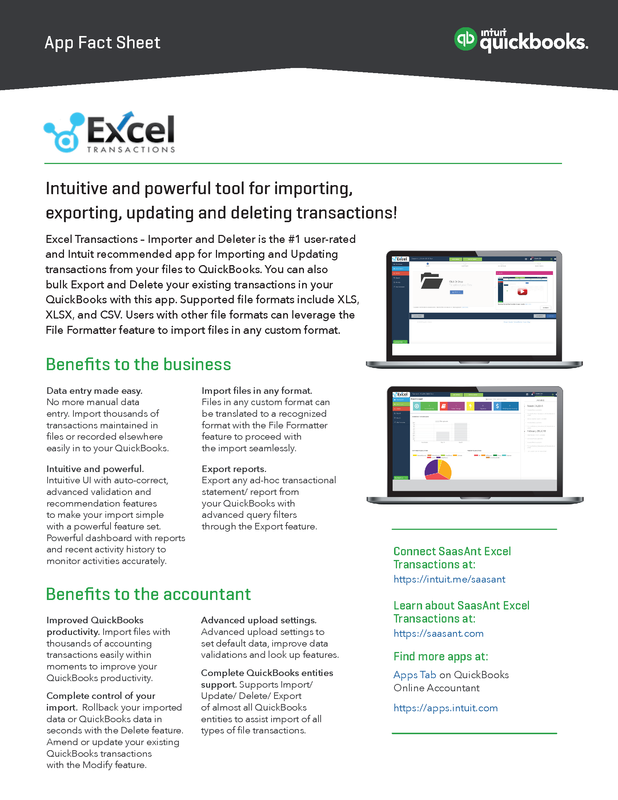 You can also bulk export and delete your existing transactions in QuickBooks with this app. Supported file formats include XLS, XLSX, and CSV. Users with other file formats can leverage the File Formatter feature to import files in any custom format. Download a PDF version of the fact sheet for review and to share with your clients. Editor’s note: Check out this SaasAnt Case Study and SaasAnt Excel Transactions Checklist.